The Seated Liberty theme appeared on the U.S. quarter beginning in 1838 and continued through 1891. Arrows were placed on both sides of the date in 1853 to indicate a weight change and rays were added to the reverse around the eagle. The arrows and rays were later dropped. In 1866, the motto IN GOD WE TRUST was inserted on the reverse. The arrows at date showed up again in 1873-74. There are many rare issues in the Seated Liberty Quarter series. The rarest is the 1866 No Motto. It is one of a kind and is out of the question. Only five examples of the 1873-CC No Arrows exists and is virtually unobtainable. Third in line in key date status is the 1870-CC, issued the first year of the Carson City Mint. Its meager mintage of 8,340 typified Carson City output during 1870-73. Production was limited because of politics back East. The 1870-CC Seated Liberty Quarter has increased in value so greatly that it exceeds the limit of our chart. The blue line above tracks the percent increase in value for the 1870-CC in G-4 condition since the Year 2000. The red line is our Rare Coin Values Index, which reflects the composite percent change since 2000 of a pre-selected group of 87 rare US coins. The goal of the Index is to estimate the strength and direction of the overall rare US coin market. 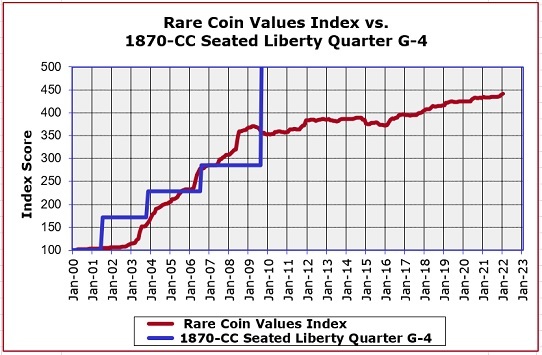 The 1870-CC Seated Liberty Quarter is one of the 87 coins that comprise the Rare Coin Values Index. The Index is updated monthly.